There are seven different genera in the family classified as rabbits, including the European Rabbit (Oryctolagus cuniculus), cottontail rabbits (genus Sylvilagus; 13 species), and the Amami Rabbit (Pentalagus furnessi, an endangered species on Amami Oshima, Japan). 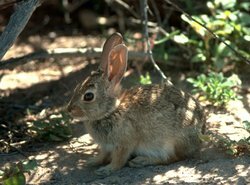 There are many other species of rabbit, and these, along with cottontails, pikas and hares make up the Order Lagomorpha. Rabbits are distinguished from the related hares in that they are altricial, having young that are born blind and hairless; many also live underground in burrows. 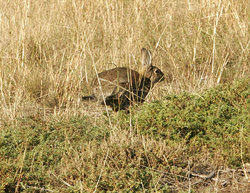 For jackrabbits, which are actually hares, in the genus Lepus, see hare. A male rabbit is called a buck, and a female is called a doe. A baby rabbit is called a kit, which is short for kitten. Rabbits vary in size and weight. As lagomorphs, they have four incisors on their top jaw and two on the bottom jaw, that grow continuously throughout their life. This is distinct from rodents, which have two each on the top and bottom. Rabbits have long ears, large hind legs, and short fluffy tails. Rabbits move by hopping, using their long and powerful hind legs. To facilitate quick movement, rabbit hind feet have a thick padding of fur to dampen the shock of rapid hopping. Their 4 toes are long, and are webbed to keep them from spreading apart as they jump. They have 5 digits on their front paws. Depending on the species of the rabbit, one can reach a speed of 15-20 m/s (35-45 mph). Young rabbits appear to 'walk', instead of hopping. They are well-known for digging networks of burrows, called warrens, where they spend most of their time when not feeding. Humans' relationship with the European or â€˜trueâ€™ rabbit was first recorded by the Phoenicians over 1,000 years BC, when they termed the Iberian Peninsula â€˜i-shephan-imâ€™ (literally, â€˜the land of the rabbitâ€™), which the Romans converted to the Latin form, Hispania, and hence the modern word Spain. The European Rabbit (Oryctolagus cuniculus) is the only species of rabbit to be domesticated. All pet breeds of rabbits - such as dwarf lops, angoras, etc. - are of this species. 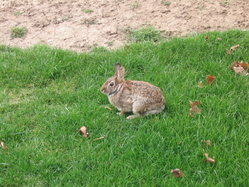 However, rabbits and people interact in many different ways beyond domestication. Rabbits are an example of an animal which is treated as food, pet and pest by the same culture. When used for food, rabbits are both hunted and raised for meat. Snares or guns along with dogs are usually employed when catching wild rabbits for food. In many areas rabbits are also raised for meat, a practice called cuniculture. Rabbit pelts are sometimes used as part of accessories, such as scarves. Rabbits are also very good producers of manure; their urine, being high in nitrogen, makes lemon trees very productive. Their milk may also be of great medicinal (see links below) or nutritional benefits due to its high protein content. Prices current as of last update, 04/11/19 11:57am.